Big Meat Eater is the best film ever made. Okay, perhaps that’s something of an overstatement, but it sure is a lot of fun. A ready-made cult film from the early part of the eighties, it’s little seen or mentioned these days. Well, not much to my knowledge, anyway. I’d like to contribute a little something to rectify this, as I truly feel it has a lot to offer in terms of entertainment value, for the open minded viewer. Any film which features wind-up toy robots as aliens, home-made flying saucers, zombies with egg-beaters for hands, murderous giants and multiple musical numbers has to be worth an hour or so of your time. In addition to all of the above, Big Meat Eater is made in Canada, so you’ve got an extra level of the ‘exotic’ as well! Bob Sanderson (The Pee-Wee Herman-like George Dawson) is the Butcher of ‘Burquitlam’, and as he struts and tap-dances around the town, we hear our first musical number. I challenge you to get the broadway-ish “Who’s that man” out of your head, even weeks after you’ve finished your viewing. Bob soon attends a town meeting where the corrupt Mayor (Howard Taylor) is detailing changes to the running of the town, flanked by his mobster-looking guards. Bob also wants to present his new easy-to-learn Burquitlam language to the townsfolk. Before he can get much of a speech in, the hall gets stiflingly hot and smoke billows up from vent. The Mayor sends one his goons downstairs to the boiler room, to investigate. Meanwhile, the huge Abdullah (Big Miller) is stoking the furnace and singing us a song about the ‘Baghdad Boogie’, along with several Arabian dancing girls who pop out of nowhere. The goon enters the room and hassles Abdullah about the overheated conditions, The giant promptly flies into a rage, strangles the hapless lackey and stuffs him into the incinerator. Upstairs, the crowd panics and flees, as smoke billows into the hall. Outside the Mayor confronts Abdullah, who stuffs him under his car bonnet and severs his hand off with the fan-blade. This quickly kills him, for some reason. After some confusion, Abdullah ends up taking the Mayor’s body to Bob the Butcher’s shop. By the way, Bob’s motto is “Pleased to meet you, meat to please you.”, probably the best promo for a butcher ever. Even though he can sing, Abdullah can’t seem to talk much, so with good reason, doesn’t explain in any detail that he’s hidden a corpse in the butcher’s cool store. Bob even ends up taking Abdullah on as an apprentice. He’s that sort of a mister nice-guy. The situation soon becomes strange, as a woman enters the store and asks for some mincemeat. The crazed Abdullah proceeds to tear the meat apart with his bare hands, all the while singing a song about being the “Big Meat Eater”. You really have to see and hear this gross scene to believe it. As life goes on in Burquitlam, Aliens descend in their flying saucer. Aliens that are actually wind-up toy robots. These terrifying creatures are after ‘Balonium’, a fuel that is a green goo forming in Bob’s septic tank after he throws rotting meat and off-cuts into it. They revive the dead Mayor from the deep freeze, and put him back to work with helping their sinister plans. The next time we see him, he’s concealing his new egg-beater endowed hand and the antennas sticking out of his head. The Mayor is now commissioning a huge structure in Burquitlam, which is actually a landing pad for the aliens to come and conquer the planet. To get this done, he orders local builder Josef Wczinski (Stephen Dimopoulos) to build the structure over his own house. This does not sit well with his family, including inventor son, high-school student Jan (Andrew Gillies). Much arguing ensues with the struggling Josef and his wife Rosa (Georgina Hegedos) who wants to stay in their house forever. For fun, the aliens briefly mutate Jan into a Black Lagoon-like monster (barely seen) who stalks his sister, Nina (Sharon Wahl) while she’s on a date with a local greaser. He soon changes back, none the wiser from the experience. Wanting to find the ultimate power source to power a secret space vehicle he’s building, Jan shows the visiting Bob his strange chemistry experiments, going on to sing a new wave song about science that sounds straight out of Devo’s back catalogue. It’s great stuff! With the Mayor back in re-animated action, Abdullah appears to have gotten away with his crime. The hulking ‘apprentice butcher’ takes to including neighbourhood dogs in the meat served up to townsfolk. Burquitlam decides to throw a talent quest, and Bob shows up to sing a song about his beloved town. It’s soon interrupted by Nina’s greaser boyfriend and his band, made up with lipstick, eye-liner and cheap suits, singing a song about being a ‘Heat-seeking missile’. Nina plays keyboard and the suggestive lyrics soon have young and old, and really old, up on the dance floor for a good old-fashioned boogie. It’s one funny scene, I assure you. In the backroom the Mayor has a fight with Abdullah, and the giant seems to come out on top, even though the Mayor-zombie wields a deadly egg-beater hand. Later, he attacks Bob - knocking him into bloody unconsciousness with a pig’s head - and throws him into the septic tank. The aliens, looking for more amusement, turn Bob into a mindless, mutated creature. Basically, he looks like he has some seaweed draped over his face. This ‘creature’ invades the Wczinski household, frightens the women and disappears. Jan, having stolen the Mayor’s abandoned car, discovers that ‘balonium’ is the fuel source he’s been looking for in his experiments all along. He plugs a supply of it into the car, and drives up and into the night sky. He promptly crashes straight into the invading aliens’ flying saucer and sends them hurtling earthward, straight at Butcher Bob’s Butcher shop! As a wise man once asked, Who will survive, and what will be left of them? Never fear, good folks, all turns out quite happily. You’ll come away hopefully whistling a familiar tune , and not dismayed by the ending. I have fond memories of this film, and vaguely remember watching it back in my college days on the big screen. It was an pleasant experience back then, and a recent viewing was just as enjoyable. As directed by Chris Windsor, Big Meat Eater is truly a film beyond criticism. It wears it’s low budget as a badge of glorious achievement, and there should be no issue watching flying saucers made of tinfoil wobbling around in the night sky, or toy robots promoted to the status of evil invading aliens. Is it one of those self-conscious, trying-to-be-a-cult film type of experience? I just found it fun. We don’t require Oscar worthy performances with this type of film. Everyone does their best with the type of broad roles they’re given. ‘Big’ Miller truly gives off a simmering physical menace as Abdullah though. 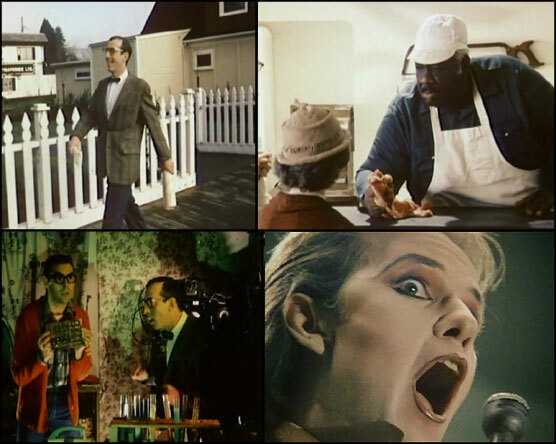 George Dawson as Bob the Butcher channels Paul Reubens in some of his physical movements but is a more innocent character than Pee Wee Herman, who has a mean side to him. Bob is just a nice guy! I guess if you don’t like musicals, give Big Meat Eater a miss. As a fan of offbeat cinema I can get into any genre, as long as it’s not boring. All the songs are well-done and varied, from the tap-dancin’ ‘Who’s that man’, the jazzy ‘Baghdad Boogie’, the eighties punk-new wave of ‘Mondo Chemico’ to the slow-rocking sexual groove of ‘Heat Seeking Missile’. Is it a genuinely funny film? I wasn’t falling off the couch in fits of laughter all the way through, but the crowd’s response to the salacious ‘Heat Seeking Missile’ - everyone gets up and dances, including the very elderly - is quite amusing. Big Miller is a giant, surly brute for the ages, then he adds a new level of memorable when he lets his jazz self out in his musical numbers. There’s a mood of enthusiasm throughout Big Meat Eater that seeps, green balonium-style, out of every scene. It gives me the impression everyone was enjoying putting this modest classic together. Yes, it’s quite a low-budget movie, but egg-beater hands and cheap flying saucers don’t need a million dollars to assemble. Yet they’re as memorable as anything else from the eighties! My closing comments on Big Meat Eater would be if you’re in the mood for a bit of light silliness, I’d definitely give this little cult gem a look. There’s an incredible amount of entertainment value crammed into its running time. Chances are, you’ll have some very hummable ‘earworms’ swimming around in your head for weeks, but you may have reason to question your local butcher’s methods for some time to come.